Our chiropractors have been helping patients achieve a higher level of health for more than 25 years. As a sanctuary for healing, our practice is designed with modern and serene features. Serving our community since 1984, Sycamore Valley Chiropractic is here to provide you with the highest quality of natural health care. In our comfortable, welcoming environment, you’ll feel right at home. Our team of Danville chiropractors use a variety of different techniques, suiting all ages and levels of health. Whether you’re looking to restore your body after an injury has left you sidelined, or want to feel as good as possible, Sycamore Valley Chiropractic is the perfect place to begin your journey to wellness. As Danville chiropractors, our team of renowned doctors truly care about your wellbeing and aim to make a difference in the lives of our patients. When you’re with us, we hope you’ll always feel like a part of our family. 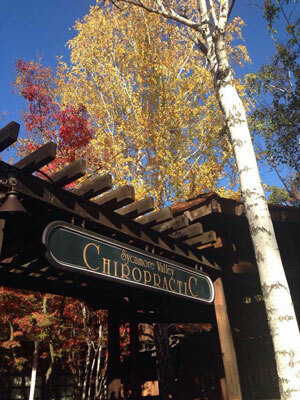 At Sycamore Valley Chiropractic, we’re proud to offer patients a unique environment for healing. Our unique team approach ensures that you’ll always receive the best care possible that your body needs to feel better and heal better. Best of all, your treatment plans are always custom and tailor made for you. When you’re with us, we’ll always put your needs above all else! Whether you’re seeking care for yourself or a family member, we’re confident in our abilities to help you unlock your true health potential. When you choose our practice for care, we hope you’ll feel like a part of our family. To better accommodate our patients, we’re open Saturday’s and accept walk-in appointments. Our Danville and San Ramon chiropractors happily accept certain insurance plans and offer an affordable cash rate. Restore your health today and get back to the life you love. Contact our practice to book your first appointment! We take the time to treat you as a person and not as a condition. The first visit was good, and subsequent visits have been amazing! I really appreciate Jessie being available Saturday morning when I needed it most. Everyone was wonderful, friendly and professional. Great experience with knowledgeable and caring chiropractor. I look forward to continuing my treatments. I have received very professional and caring treatments. All of my questions were answered and I received information that will help me remain healthy. I went for postpartum massage and pain relief and I was helped enough that in the very first visit I could feel my pain went down to just being 20%. I am sure couple more visits will get me in shape and fit and fine. Very impressed with everyone and the service. I loved how thorough the exam was and how much time everyone spent with me. It has taken me a long time to find a chiropractor that I connected with, but Dr. Shanda Fuller has filled that void for me. She is amazing!! I feel I am in the right place. Thank you! I really loved my experience with SVC! Each interaction was positive! From the initial call all the way through to the appointment and the stim & ice after! Thank you for making my experience a positive one! In a word…”fabulous” I am so glad that I was referred to your practice! Dr. Call is the most through and knowledgeable chiropractors I have ever met. Very impressed. Dr. Call was very thoughtful and caring regarding my situation. His examination and comments regarding my treatments were thorough. I have every confidence in him. Everyone in the office was extremely welcoming, helpful and kind. I love this office! Thank you for the kindness and friendliness of the staff. Each part of the exam and therapy was well explained, done professionally and my pain was relieved. Thank you. Dr. Shanda is my first chiropractic experience and i was extremely satisfied with her knowledge, skill level, communication and overall caring nature. It was all perfect. The staff was very nice and I Love Dr. Shanda Fuller personality and she helped a great deal! I highly recommend your place. Dr. Kelly Hall is the BEST! Dr. Ko is the ABSOLUTE best…really! Take it from a skeptic…she has done wonders for me. In a few weeks, she out-performed orthopedic doctors and physical therapists…what a find! I am amazed after only one visit I feel the best I have felt in seven months! My experience was amazing. I now have hope that I will be pain free soon! All the staff, including Dr. Call, were very courteous and efficient. Feeling better already! Thank you!